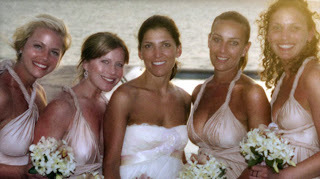 Home / Bridesmaids Buzz / Our Interview with Ariane Goldman of twobirds bridesmaid. Our Interview with Ariane Goldman of twobirds bridesmaid. Ariane Goldman, founder and creator of twobirds bridesmaid, has given brides everywhere something to swoon over, retie, and swoon over all again! She created a versatile and unique bridesmaid collection, that would make any girl feel comfortable and chic. We were lucky enough to chat with the Manhattan born and raised designer about some of the inspirations for her classic collection and her newest design, the hi-low gown! Q. Tell us a little bit about yourself. When did you realize you wanted to become a designer? A. I have been an entrepreneur since I started my own jewelry line at age 9 - I have always had the itch to launch companies where there is a need in the market. When I was getting married there was nothing out there I liked for bridesmaids so I found fabric and got the dresses made for my four maids who had completely different body types. The reaction was amazing so the light bulb went off and I quit my job at Amercian Express and started twobirds from my apartment in the West Village. I didn't get to do much design with twobirds (since it is just one dress) which is what led me to starting HATCH (a line of maternity clothes that you can wear before, during + after pregnancy). I believe in enabling women to invest in pieces they can wear again through stages of life. Q. We are loving the new hi-low gown. How would you accessorize it? A. I am not a big jewelry person, but I would rock it with statement earrings and my hair in a high bun. The hi-low gown is just so versatile and flattering on all body types since you have the option to wear it with a sash for a cinched waist. Easy, chic and a one-stop shop is how I like to design. A. While the design of twobirds is timeless, it's important to show customers how versatile the dress is and how it can be dressed up or down after the wedding. I understand the desire to want to wear something different ways, so I thought the new site should demonstrate the endless ways to wear the twobirds dresses. What is your favorite twobirds tie? A. The one shoulder Grecian twist is a show stopper when you are walking down the aisle. Q. The twobirds dress is flattering on all different body types. Any suggestion for expecting bridesmaids?